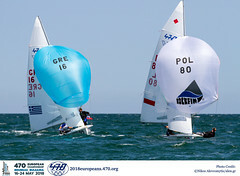 The Rio 2016 Olympic partnereshipof Kazuto Doi/Kimihiko Imamura wrapped up victory at the 470 Class Japan Championships 2016, with a significant margin of 7 points. Held from 17-23 November at Shin Nishinomiya Yacht Harbour, the seventy-two teams from across Japan and two teams from Hong Kong, contested the 8-race Championship series, before the top 10 teams advanced to the double-points medal race. 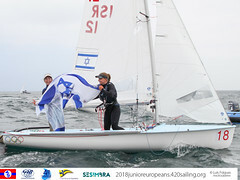 The final medal race day featured a frisky 20 knot breeze and cooler weather, with the other teams fighting it out in a final gold and silver fleet final race. 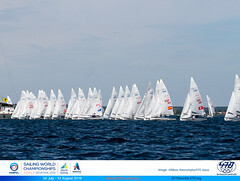 Depending on the race course, the sea conditions were either big waves or flatter waters. Victory in the medal race for Kazuto Doi/Kimihiko Imamura marked their third consecutive title at the 470 Class Japan Championships. Chasing hard though are the next generation, pushing Olympians Doi/Imamura, as they seek to claim their place amongst Japan’s top 470 sailors. Amongst those campaigning for Tokyo 2020 are second placed Sho Kaminoki/Taisei Hikida and Tetsuya Isozaki/Akira Takayanagi who finished in third. Winning the Women’s Championship title were Misaki Tanaka/Aysno Kudou. Second to Mano Udagawa/Yurie Seki and third to Yuki Hayashi/Sayaka Kimura.